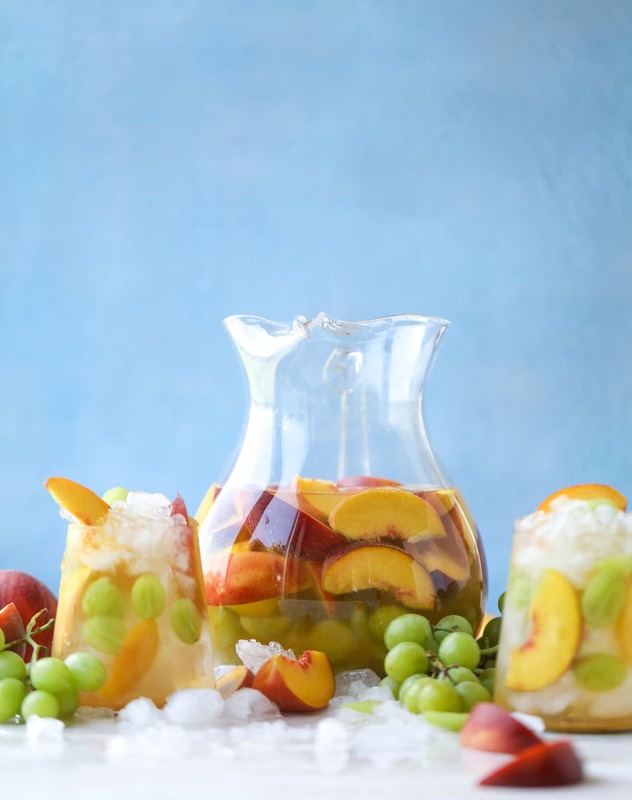 Welcome to the millionth sangria recipe on this blog! 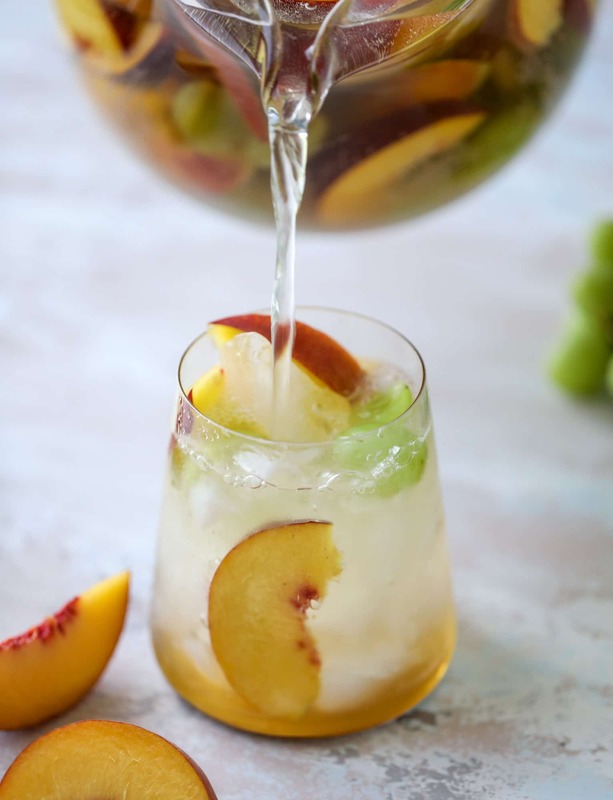 A pinot grigio sangria, a pinot peach sangria, all made up with pretty summer fruit and bubbles ready to go for the weekend. 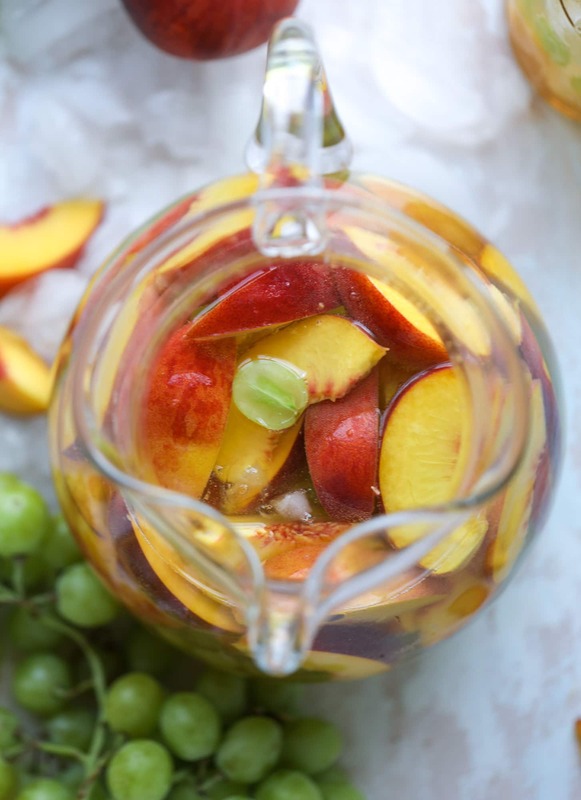 It was only a matter of time before threw peaches into sangria and tried to make it a thing. You might remember that last year I started using an entire bag of FROZEN peaches in almost all of my sangrias because it’s an excellent way to keep the pitcher cold without watering down the booze. So just how on earth is this one different then? Here, we’re using some peach nectar and fresh peaches of course. Only pinot grigio and brandy – and frozen green grapes as well. Normally, I couldn’t care less about green grapes but if they are frozen and thrown into a vat of wine, I’m in. This is so super light and FRESH. Like, fresh a la the scene in Bridesmaids where Kristen Wiig is sipping her lemonade in the car at the baby shower. You know. All obnoxiousness aside, this is another fruity summer punch (hello, lavender sangria) that I’m just over the moon about. It’s not like we NEED a bunch of different sangria and punch ideas, but it sure is fun. Especially if you get bored. Often. Not like I know anything about that. A special sangria for every occasion? That sounds like my speed. 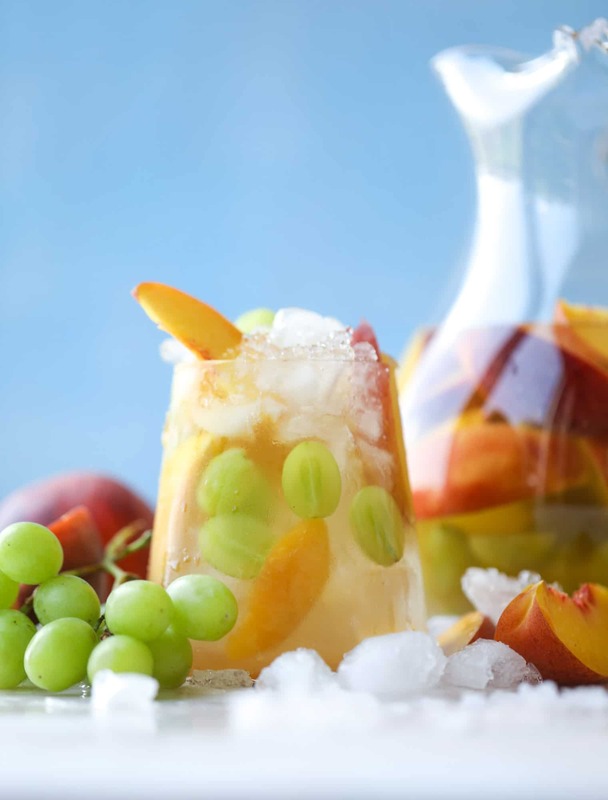 Place the frozen peaches and grapes in the bottom of your pitcher. Pour the wine, peach nectar, brandy, grand marnier, and club soda over top and stir. This tastes great when it sits in the fridge and “marinates” for a bit. But you can also serve it right away! The frozen fruit acts like ice cubes and keeps it super cold. 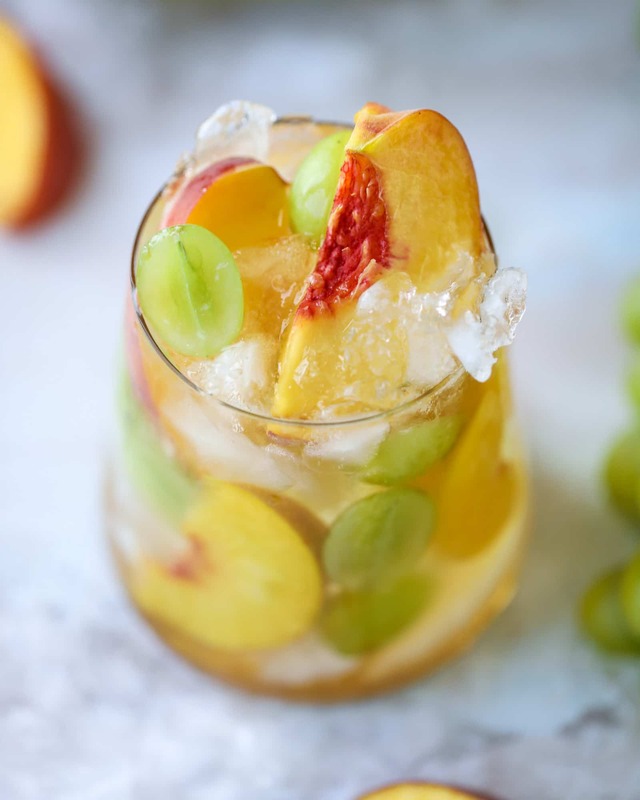 Serve over ice and garnish with fresh peach slices. It’s also basically a meal, because… look at all that fruit! Those frozen green grapes are the perfect addition! Like little gems. This looks perfect! I definitely will be making this soon; peaches in anything this time of year, is always great! Ok this might be my favorite sangria creation of yours yet! I’m 39 weeks pregnant and can’t tell you how amazing this sounds. I want all things peach!! This is amazing. 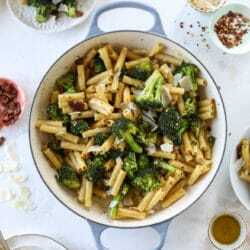 Craving it at work right now and I have to make it this weekend! I did something similar with pinot, oranges and peaches. I added a few shots of peach and orange Deep Eddy vodka. Soooo dangerous. I’ll have to try the frozen peaches next time! I tripled this recipe for a friend’s 50th birthday bash this weekend. Light and refreshing, it was a total hit! And gone really early! I will make again and again! 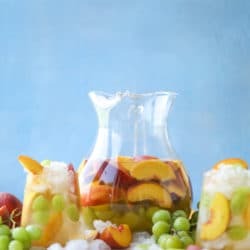 Sangrias are a popular punch to serve guests for almost any occasion and over the years the original sangria has been adapted, revised, and reworked many times. 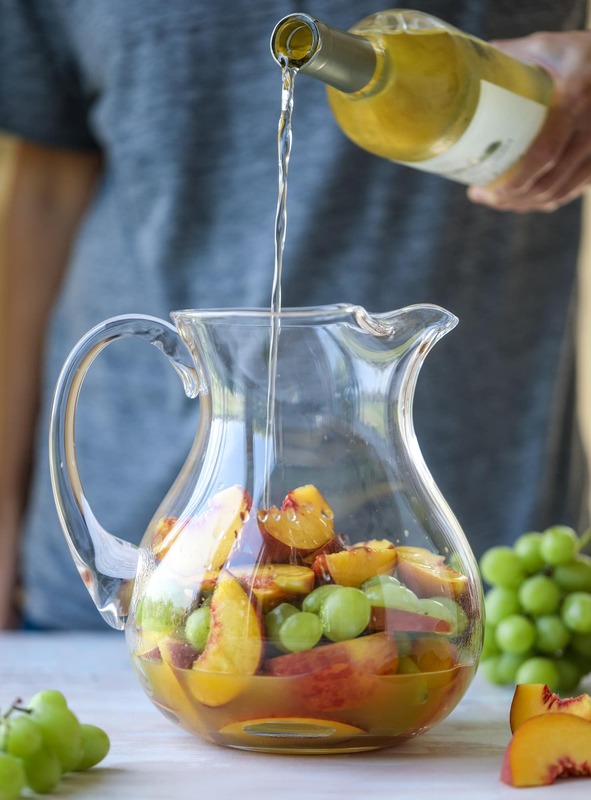 The beauty of sangria is that you can easily make it your own.